This pigment is gained from the Copper Hill Mine, located in the southeast corner of Tennessee. It is primarily composed of iron oxide (63%) and such trace elements as copper, silica and cobalt. 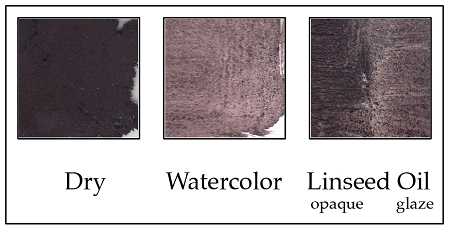 The mesh size on this pigment ranges from 150 to 270. While this pigment has slight amount of tooth to it, it still brushes out evenly. Q: I think that is the coolest toned earth pigment I've seen. It's an interesting color. My question: where are the Copper Hill mines located? I'm familiar with the old Champion mines, since the site isn't far from my home, but I don't know where these mines are. Virginia? Thanks. A: The Copper Hill Mines are located outside of Chattanooga, TN. All of their pigments are quite unique and behave unlike any of our other pigments. For details, try them and see for yourself.